Bethesda, Maryland, 2017-Jun-17 — /Travel PR News/ — As part of its global commitment to develop and empower future women leaders, Marriott International (NASDAQ: MAR) today announced a partnership to support Asian University for Women (AUW). Starting this year the partnership will see over 50 Marriott volunteers serve as mentors to AUW students, and six AUW students will be given the chance to experience working with Marriott in Hong Kong and locations across south Asia, gaining personal experience of how the world’s largest hospitality company operates. AUW seeks to educate a new generation of female leaders in Asia who demonstrate significant academic potential, courage and empathy for those in need and might not otherwise be able to attend university for social or economic reasons. Peggy Fang Roe, Chief Sales and Marketing Officer for Marriott International Asia Pacific and Executive Sponsor of the Marriott Women in Leadership Initiative, said: “As a business that prides itself on its diverse talent, we’re honored to help the next generation of women leaders achieve their full potential. Having seen firsthand how the Asian University for Women transforms the lives of its students, we’re thrilled to help even more young women gain the skills and confidence they need to succeed. By working together, Marriott International and AUW aim to create a world of opportunity for Asian women on a mission.” See Marriott’s visit to AUW in Chittagong and meet the students. Marriott will also launch a global fundraising drive for AUW, targeting internal associates and partners. Marriott International properties across Asia Pacific will also educate customers in-room about AUW and its mission, inviting them to contribute towards its future. As part of this fundraising drive, Marriott International supported AUW Hong Kong Support Foundation’s first benefit gala, “In Honor of Daughters,” at the JW Marriott Hong Kong on 13 June 2017. Gala attendees will be able to hear the inspiring stories of current and former AUW students, like Choney Dema. One of eight siblings, Choney is the first to make it to university. “Both of my parents are farmers yet they educated all of us. But in many rural parts of Bhutan, many children are not in school as their parents cannot afford school expenses and they have to help their parents at home,” said Choney. The majority of AUW students are the first in their family to attend university and nearly all students are on full scholarships. Marriott International’s partnership with AUW reflects its broader commitment to enabling opportunities for women, both in and out of the workplace. Its related initiatives include the annual Women in Leadership conference and the East China Female Leaders Aspiration Program, both of which support the company’s goal to help female associates take on leadership roles. Marriott’s Market Ambassadors program also encourages associates across 11 countries in Asia Pacific to design local Women in Leadership initiatives. Marriott was named one of the Fortune 100 Best Places to Work For and has a critical mass of women in leadership roles throughout the globe. 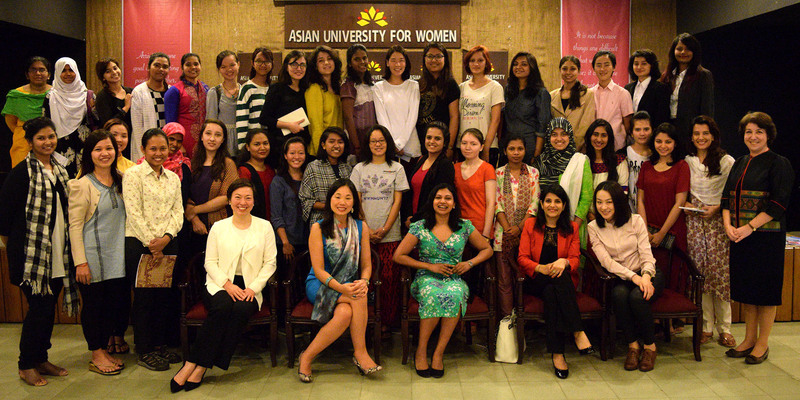 ASIAN UNIVERSITY FOR WOMEN (AUW) is an independent, international university in Chittagong, Bangladesh seeking to educate a new generation of leaders in Asia. AUW admits students solely on the basis of merit, regardless of their family’s income level, and nearly all students are on full scholarship. Currently, AUW has more than 600 students from 15 countries. AUW offers two pre-university preparatory programs called Access Academy and Pathways for Promise, as well as a three-year undergraduate program based in the liberal arts and sciences. The University is committed to graduating women leaders who will tackle their countries’ social, economic, and political issues while collaborating across cultural, ethnic, and religious lines. For more information, please visit our website at www.asian-university.org. Marriott International, Inc. (NASDAQ: MAR) is the world’s largest hotel company based in Bethesda, Maryland, USA, with more than 6,000 properties in 122 countries and territories. Marriott operates and franchises hotels and licenses vacation ownership resorts. The company’s 30 leading brands include: Bulgari®, The Ritz-Carlton® and The Ritz-Carlton Reserve®, St. Regis®, W®, EDITION®, JW Marriott®, The Luxury Collection®, Marriott Hotels®, Westin®, Le Méridien®, Renaissance® Hotels, Sheraton®, Delta Hotels by MarriottSM, Marriott Executive Apartments®, Marriott Vacation Club®, Autograph Collection® Hotels, Tribute Portfolio™, Design Hotels™, Gaylord Hotels®, Courtyard®, Four Points® by Sheraton, SpringHill Suites®, Fairfield Inn & Suites®, Residence Inn®, TownePlace Suites®, AC Hotels by Marriott®, Aloft®, Element®, Moxy®Hotels, and Protea Hotels by Marriott®. The company also operates award-winning loyalty programs: Marriott Rewards®, which includes The Ritz-Carlton Rewards®, and Starwood Preferred Guest®. For more information, please visit our website at www.marriott.com, and for the latest company news, visit www.marriottnewscenter.com and @MarriottIntl. This entry was posted in Hospitality, Hotels, People, Society, Travel, Travel Education & Courses and tagged Asian University for Women, AUW, Bangladesh, Chittagong, Choney Dema, Daphne Tan, East China Female Leaders Aspiration Program, Hong Kong Suppport Foundation, Marriott International, Nirmala Rao, Peggy Fang Roe. Bookmark the permalink.